Creating pieces that cater to mom’s needs is everything that we strive for, especially for our design team. 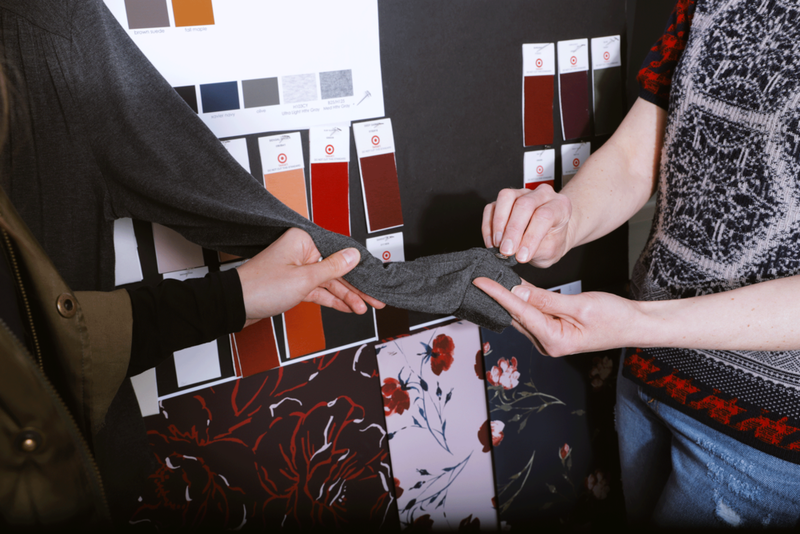 Ever wonder the process of how we create each collection every season? We sat down with our Senior Designer, Staci Morris on what she and the team are currently inspired by and what you can look forward to in the Fall. Get some insight on what to expect in the cooler months of 2019. What inspired you and the team for this collection? (Other designers, nature, shapes, culture, music, etc). I was super inspired by all the asymmetry that I was seeing on the runways and out in the market, and carried that thread throughout the collection in different ways in various dress silhouettes. I also love the varsity trend and worked that in for an additional mama/babe look. I am a lifelong Northern California gal, and find that the laid back style here mixed with the practical efficiency of the Bay Area culture influences the design ideas I bring forth. I love easy-to-wear pieces that fit well and have an interesting design detail or standout trim. What are some textiles, fabrics, colors, prints, etc. that you’re excited about this collection? I am pumped about velvet! It’s a staple for the holiday season and we are giving her a couple great options, and we have a gorgeous crimson red dress that is perfect for family photos and holiday parties. I also used a metallic knit fabric to give her a bit of sparkle and put it in a flattering dress silhouette. We pulled together a beautiful mix of moody florals and a classic leopard print to give our customer some great pattern options. Generally, what can we expect from the new collection in Fall? I’m really excited about the Fall collection because it’s a mix of ultra-flattering silhouettes in rich textures and colors. We have also sprinkled in some great graphics, and evolved our signature Mama and Babe jackets for a major Mini Me moment. Having styled a lot of pregnant clients in the past, I know that there is always a need for holiday occasions pieces and that was a big focus in this collection. Can you let us in on the thought process for Fall’s collection? Our goal is always to make clothes that are comfortable and flattering for any occasion. I always start by looking at what pieces are already working, and think about how I can make them even better – sometimes that means introducing a new seasonal fabric, or taking a certain feature of a piece as a starting point. For example, we have a beautiful jumpsuit that is very slimming, and I changed the sleeves and neckline to make it more suitable for a rich velvet fabric. Is there an ongoing product that you improved this season? Yes! We have a classic print shirt that is very versatile, and we updated the fabric to one with a softer feel for extra comfort. I also added front buttons so she can use this a nursing/pumping top, if she chooses to breastfeed. I love being able to give our mamas added value and reasons to continue to wear our pieces after she has her babe. New additions to the Fall collection that we can expect? In addition to our elegant dress offering, look forward to a Camo capsule, new trend-forward active and casual pieces, and some insta-worthy Mama & Babe pieces. How will this collection be different that last Fall’s collection? In general, we have shifted to a heavier dress offering with an intentional bump-proud aesthetic. What can we expect from Ingrid & Isabel in 2020 overall? We are constantly learning from past seasons and continuing to innovate in the areas of fabric and fit so we can give our mamas the pieces she will want to live in during her pregnancy and after.